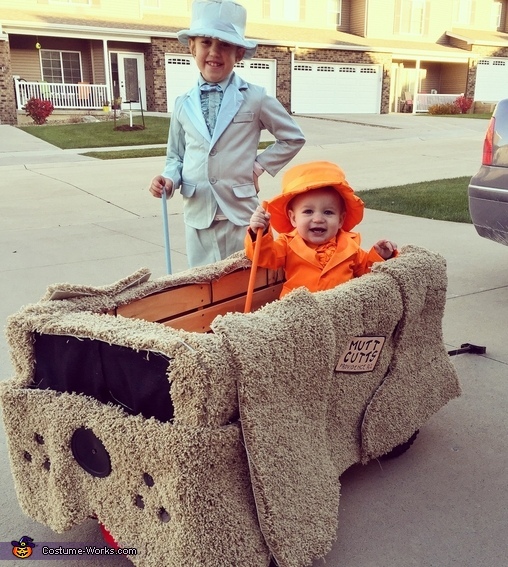 This homemade costume for kids entered our 2014 Halloween Costume Contest. This is Lola (7) who is dressed as Harry Dunne and Bennett (16 months) dressed as Lloyd Christmas. We wanted to incorporate our wagon in their costume so we could transport Bennett easily. I saw the tuxes and realized we had leftover carpet in our garage and the van idea came to me! My husband laid the carpet out and looked at a photo from the movie Dumb and Dumber and pieces it out. We used felt for the face. The costumes didn't come with canes so I bought a dowel from Lowes and painted them to match. They had so much fun!! !